Thanks Mike, I will think about it. Some fantastic pictures taken by our friend David (16DownUnder / @ferrari .videos) of his ILUAL43 LED rear lights installed on his 16M! David, you're real pro photographer ! Our bright new Safety Brake Flasher system with deceleration sensor is out and encounters already a great success ! This complete stop light management system, will flash all your stop lights including the center stop light depending on the deceleration force! The centralized ECU system and the embedded deceleration sensor will detect the level of deceleration and flash the stop lights through a complete new Plug & Play high standard rear light wire harness on which the stop lights and center stop light will be connected. Imagine the quite common situation when you brake normally but then you need suddenly to brake much harder. With the stock stop lights, nothing will tell the drivers behind that you decided to brake harder as the brake light will just remain steady on. With this new ECU flasher system, depending on the level of deceleration, the stop lights will start to flash even if you didn't remove you foot from the brake. This is a huge safety improvement for a car like a Ferrari that can brake really hard. Of course, when you press directly hard your brake pedal, this system will also flash your stop lights accordingly to the deceleration force. Your stop lights will flash faster, the harder you presses down on the pedal. The system is entirely configurable among more than 3000 setting combinations! Thanks Stef for your encouragement on my pics. Unfortunately I'm only an iphone6 user, so it's very hit or miss. Your new flasher unit is fabulous. I have your previous set up and have all my taillights configured for maximum flash. I have found them fabulous. They are so noticeable even in the daylight. I am a member of a 80 or so strong supercar club and the other guys have commented on how effective my lights are. With your new model, following cars will get an impression on how hard you are stopping. Brilliant stuff. I will repost your Instagram videos on my @ferrari .videos page. Many thanks David I must say I'm pretty proud of this achievement. The embedded firmware works really fast and will detect any deceleration in milliseconds when the brake pedal is engaged. The ECU can be entirely configured at wish. For instance, if you don't want the stop lights to flash when you're braking normally, it can be deactivated. Stop lights then will flash only at medium and hard brake force, both with a different and configurable flash pattern. Some update also on this new product which is also now available! As some people got confused between the G-Force Safety Brake Flasher and the F1-Style Safety Flasher, I wanted to take the chance to clarify. The F1-Style flasher, even if it will flash your 3rd brake light (or center stop light), is completely independent of the brake system. Like on F1 race cars, it will make the 3rd brake light flash continuously with a remote control unit, whether you're braking or not. Although, if the F1-Style flasher is on and you're braking, the 3rd brake light flashes will stop and go steady on (to show that you're braking). As soon as you stop braking, the flashes will resume. Both systems can be installed together and are perfectly compatible. Since already several years, we've been working hard to improve the F430 headlights and provide them a better look with a DRL light solution. Our current DRL light version, launched since now more than one year, provides a high level of brightness which is good enough visible at day and very visible at night. Last but not least, they don't flicker as most stock DRL lights do! Some short videos taken at day light. Videos and pictures are very conservative. In real life, they look well much brighter! Argh - you addressed my only criticism of the previous version: it wasn't bright enough in daylight. How much are these new versions, Stef? Thanks Stef. I will order a set after Christmas. Here's a close-up picture of our new heat sink that is sandwiched inside the ULTIMATE LED light. We developed a specific shape to allow the heat to be better absorbed, then evacuated. As a result, the ULTIMATE DRL light stays "cool" even after 48hours permanent lighting. The heat sink remains very thin though. As for the F430/F360/F550/Enzo/F599, we developed our own LED technology which will illuminate this 3rd brake light by 40% more light than stock with a full line of bright red light. LEDs are totally invisible in this complete light cluster when not illuminated. Powered with our power supply unit, this new 3rd brake light has a super fast response time compared to the stock light. Another way to improve your safety! Awesome updates Stef! For some strange reasons my Tapatalk app does not want to work with FLife anymore...and my desktop ie browser too decided to call it quits. So its' getting quite impossible for me to browse the forum with ease. Now I'm on Chrome. It seems to work for now. I'll add those two new updates to my shopping cart once my car is almost ready. Thanks very much Buddy !! The new FL web version doesn't work indeed with Tapatalk but should work fine with IE. 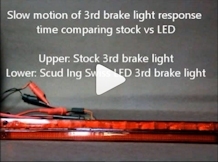 This very slow motion demonstrates the response time difference between the Ferrari stock 3rd brake light and our LED 3rd brake light cluster. A half second difference (and more with old filament bulbs) can avoid an accident! slow filament bulbs, a yellowish illumination and doesn't illuminate the entire lens. "Hi Stef, all arrived in good order and installed the full set in no time (ILUAL43 LED rear lights, ILUAL-HDRL Ultimate lights + Automatic DRL Lighting module, ILUAL-INTEL Interior Lighting System). Great manuals, impressive quality of the materials and perfect fit. What a difference! Has really changed how the Ferrari looks especially at night! Have give my 'independent' Ferrari specialist ARM here in Dubai your web details. He was mighty impressed with the results! Many thanks for the excellent & fast service!" Last edited by StefVan; 01-19-2016 at 08:46 AM. Our successful G-Force Safety Stop Light Flasher now comes with an optional Wireless Remote Control ECU. This option allows to switch between the stock stop lights (steady on-Flasher deactivated) and G-Force Flasher activated. We developed this specific option so that you can deactivate the stop light flashes just with a click on the Remote Control Unit. The ECU module will always keep in memory your last setting even when the engine is stopped. Press the A button of the remote control unit to deactivate the G-Force Flasher and your stop lights will work as stock (steady on). Press the B button to activate again the G-Force Flasher module. The wireless controllable ECU Module can be directly plugged into the G-Force Flasher module. A must have solution for your Ferrari that will considerably improve your safety as your stop/brake lights will flash depending on the deceleration force! The stop/brake light Flashes will even happen when you're already braking and suddenly you need to brake harder. This Engine Bay Lighting System is made of our own manufactured and specific color temperature LED light bars which will just perfectly emphasize the engine. For the white color, we use the same technology we've already successfully developed for the F430 DRL Headlights. For the red color, we developed a total new technology that renders a very bright and deep true red color. Such exclusive red LED color will perfectly emphasize the red intake manifolds. Delivered with a remote control unit + a Plug & Play ECU Module to remotely manage the powering of the Engine Bay LED Lights as well as the brightness. Our micro-processor based ECU will always keep your last settings in memory even when the engine is stopped. This High Profile Lighting System will make your Ferrari engine shine like a diamond!